Christophe Courteau, 49 years old, is a former student of the University of Sciences of Rennes & the Institute of Geography of Tours in France. 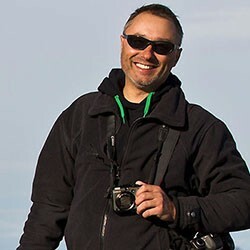 Pro Wildlife Photographer for 23 years now, Christophe attempts to show us another reality : most of these wild creatures and landscapes are under constant assault from human activity. Christophe uses only Canon Cameras, since 1980 when his dad offered to him a nice Canon AE-1 ! Flashes EX 600 II RT, EX 340 RT 550 EX -- ST-E2 and ST E3 RT. Tripod Gitzo Carbon Mountainer Performance Series & Manfrotto aluminuim 055. Monopodes, & clamps : Manfrotto. Ball Heads : Gitzo & Wimberley and SIRUI. Photo Bags : Gura-Gear's BATAFLAE 32 L, 26 L and 18 L . Waterproof Cases : Pelicans. Plus hundreds of cables and funny stuff ! Computers : MAC of course !